So whether you have a tiny space that won’t accommodate a tree, don’t want to fork out the cash for a real one that is going to turn into a spiky, dead log in a few weeks or simply want to change it up, we have an alternative tree design for you. Get the look: If you’re looking for a Christmas tree alternative that matches your ‘in vogue’ interiors (but is still relatively easy to assemble), than this copper pipe creation is your ticket to show-stopping, tree glory. All you need is a hammer and few nails, rods in decreasing length and decorations of your choice. Bonus: Don’t have copper rods handy? No worries, simply interchange them with sticks, or twist some twine or wire around the nails. Get the look: Created by French by Design, this instalment can be customised in a number of ways, from the colour of the shelving to the prints in the frame, to the decorations you choose. Bonus: When January rolls around, instead of awkwardly dragging out a dead tree to the nature strip, simply take down the Christmas decorations and swap out the festive images for your favourite prints and you have a new art installation. Metallic tape Christmas tree. OK.
Get the look: This nifty, plant free tree by Hello Lidy has to be one of the best uses of sticky tape we have ever seen. The metallic tape is the modern day answer to tinsel, with this design a great one for those with limited space. For instructions on how to create your own tree see here. Bonus: It takes up zero space and you don’t have to buy tree decorations. Plus if you make a mistake you just peel it off and start again. Christmas tree wall stickers. Just own it. Get the look: If you’re about as gifted an artist as a five-year-old with a pack of crayons, there are other wall decoration options that don’t involve you plotting out your tree’s design (see above). Vinyl Interior Design have five-wall decal design to choose from to give any room that easy Christmas cheer. Bonus: You don’t need to be Picasso to execute this one. Get the look: It doesn’t get much simpler than this: source a few pine branches (maybe steal a few off a friend’s tree? 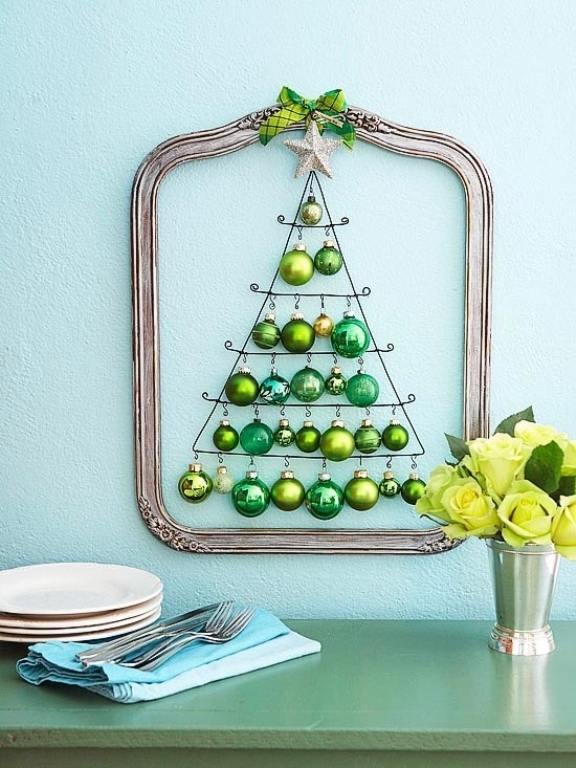 ), place them in a vase and hang some lights or baubles on it and – hey presto – you have mini-tree. Bonus: You will still get that scent of pine throughout the house. Christmas bliss. Get the look: Granted, this project might take a little more skill than popping some stems into a vase, but even for those of us who a more likely to hit our thumb then the nail, it shouldn’t be too much of a feat to construct this tree. 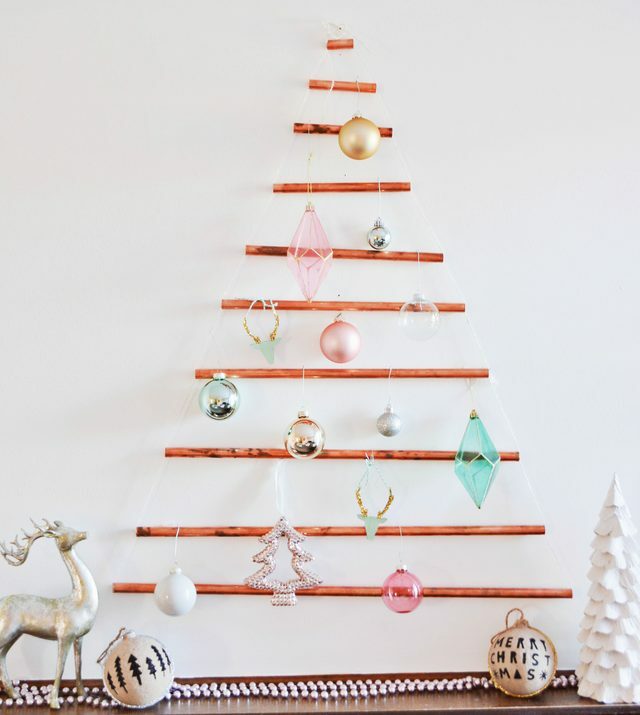 To build your tree, use almost any type of timbre or wood (this one designed by Katie Shelton from A Beautiful Mess was built using recycled pallets) treated with a coat of sealant or paint. Once your done you’ve got a tree that can be rolled out year after year, making the end result worth all the effort. Bonus: This tree can double as an advent calendar by hanging little parcels off it. For a how to guide see here. A Christmas tree that doubles as a herb garden. Genius. Get the look: A simple idea that won’t take up much space, this clever christmas tree from Domino is perfect for those after some fresh that packs a fragrant punch. Simply string up the bunches of herbs (sage, thyme, rosemary, tarragon – any herb will do) at differing heights to create the desired shape. The bunches can be hung off just about anything, from hooks, to a pole, to sticks. Bonus: Need a sprig of rosemary for those Christmas day roast potatoes? No need to head down to the shops, just pinch a few off your Yuletide tree.